This article is about the upcoming film. For other uses, see 100 Years (disambiguation). 100 Years is an upcoming science fiction film written by John Malkovich and directed by Robert Rodriguez. Advertised in 2015 with the tagline "The Movie You Will Never See", it is due to be released on November 18, 2115, matching the 100 years it takes for a bottle of Louis XIII Cognac to be released to consumers. The film stars an international ensemble, with American actor John Malkovich, Taiwanese actress Shuya Chang, and Chilean actor Marko Zaror. 100 Years will apparently be a short film, Rodriguez having stated in a 2019 interview with French YouTuber InThePanda : "I was making several short films for them, and I finished that one first, we shot that one first, I thought that was gonna be a commercial or something. And then I showed them the movie and they said 'Yeah, that's great, that's great. That's the one we lock away.' And I said 'What? That's the one you lock away? What about the other one with the future--' 'No, that's the commercial.' [...] The one that I was most attached to was the one they locked away." The plot is a closely held secret, which is not expected to be revealed until the film itself is released in November 2115. However, teasers suggest it will be sci-fi themed and will involve a hero, a heroine, and a male villain. 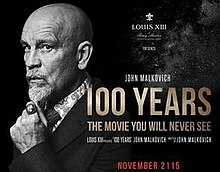 Malkovich and Rodriguez announced in November 2015 that they had teamed with Louis XIII Cognac, owned by Rémy Martin, to create a film inspired by the hundred years it takes to make a bottle of Louis XIII. Although the film's plot remains a complete secret, on 18 November 2015, Malkovich and Rodriguez released three teaser trailers: Retro, Nature, and Future. Pending release, the film is being kept in a high-tech safe behind bulletproof glass that will open automatically on 18 November 2115, the day of the film's premiere. One thousand guests from around the world, including Malkovich and Rodriguez, have received a pair of invitation tickets made of metal for the premiere, which they can hand down to their descendants. The safe in which 100 Years is kept was showcased at the 2016 Cannes Film Festival and various other cities before being returned to Cognac, France and the Louis XIII cellars. A song "100 Years", composed by Pharrell Williams in collaboration with Louis XIII, will be released in November 2117. ^ Bryant, Jacob (November 19, 2015). "John Malkovich and Robert Rodriguez Made a Movie That Won't Release Until 2115". Variety. Retrieved August 21, 2018. ^ Lussier, Germain (November 18, 2015). "John Malkovich and Robert Rodriguez Have Made A Movie No One Will See For 100 Years". io9. Gawker Media. Retrieved August 21, 2018. ^ a b Rodriguez, Robert (director) (November 18, 2015). 100 Years: The Movie You'll Never See Retro Teaser. io9. YouTube. Retrieved August 21, 2018. ^ a b Warner, Kara (November 21, 2015). "John Malkovich Explains Why He Made A Movie No One Will See". People. Retrieved August 21, 2018. ^ Rodriguez, Robert (director) (November 18, 2015). 100 Years: The Movie You'll Never See Nature Teaser. io9. YouTube. Retrieved August 21, 2018. ^ Rodriguez, Robert (director) (November 18, 2015). 100 Years: The Movie You'll Never See Future Teaser. io9. YouTube. Retrieved August 21, 2018. ^ Coggan, Devan (November 19, 2015). "John Malkovich and Robert Rodriguez made a film that won't be released until 2115". Entertainment Weekly. Retrieved August 21, 2018. ^ Rosen, Christopher (May 6, 2016). "Cannes to showcase John Malkovich movie no one will see for 100 years". Entertainment Weekly. Retrieved August 21, 2018. ^ Prince, Bill (November 18, 2017). "Pharrell Williams and Louis XIII collaborate on a song for the next 100 years (but only if we care)". GQ. Retrieved August 21, 2018. ^ "Pharrell Williams 100 Years". Louis XIII. Rémy Cointreau. Retrieved August 21, 2018. This page was last edited on 9 April 2019, at 15:26 (UTC).